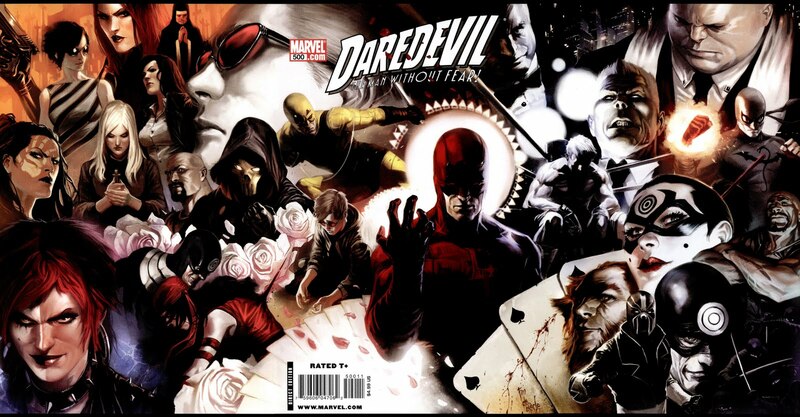 You get the conclusion to the Ed Brubaker / Michael Lark run on Daredevil. You get a preview of Daredevil under the guidance of Andy Diggle and Billy Tan. You get a bonus story (‘3 Jacks’) from Ann Nocenti and David Aja which is quite wonderful, and would easily stand in its own right as an issue of Daredevil. You get a Daredevil 500 issue cover retrospective. You get a gallery of Daredevils from various artists. This is one hell of a way to celebrate the end of the Brubkaer run and Daredevils longevity. I am quite happy to admit that this is one of the best comic books i have ever read – everything that this creative team have been doing over the last few months comes to together in a near perfect resolution. They manage to finish up all the plot strands but open up a whole new story for Matt Murdoch for Diggle and Tan to work with. The story and art flow in a beautiful way, effortlessly going back many hundreds of years to Japan, and then go back and forth in more recent time, and there is never any jarring in those jumps. The final panel of the main story is dramatic, visually arresting, a closure and a new beginning.